Fires are always dangerous, so make sure you have an adult when using a natural gas stove, oven or grill for cooking. Never leave paper, dish towels or anything flammable near an open flame on your cooktop. Don't play near the furnace, water heater, stove or grill. 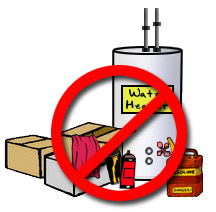 Never put flammable items near a gas water heater or furnace. Always make sure the area around them is clean and clear of flammable items like rags, paint cans, spray cans or gasoline containers. Make sure to get regular maintenance on your gas appliances and change filters regularly on furnaces. Make regular inspections of the gas connections on your gas grill to make sure there are no loose parts for gas to leak out. Never leave propane or kerosene heaters unattended. Always make sure they are free of any obstructions and away from flammable materials like curtains. Do not let pets or small children play near heaters. Never light a gas grill without adult supervision. Always make sure the propane is turned off before you leave the grill.